New York, NY, July 23, 2009—Amulet Books, an imprint of Abrams, reveals today the title, color, and cover of the fourth book in Jeff Kinney’s bestselling series with press outreach and a special online reveal available only on www.wimpykid.com. 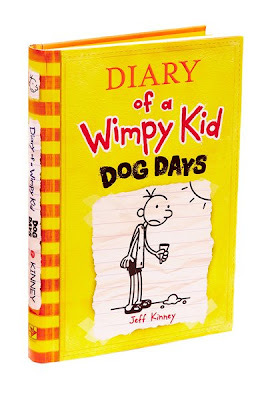 DIARY OF A WIMPY KID: DOG DAYS has a yellow cover, which follows the red, blue, and green of the first three bestselling books. It releases in a one-day national lay-down on Monday, October 12, and will have a first printing of 3 million copies. 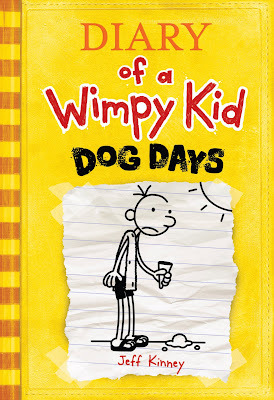 Following the astounding sales and publicity momentum of Diary of a Wimpy Kid: The Last Straw, one of the biggest book releases of 2009, Dog Days is poised to bring the Wimpy Kid series to new sales and media heights. I can't wait! Great cover, yellow is my favorite color. Displays of those are certainly going to catch the eye!